Many of London's parks and public spaces are still lit by gas lamps, and there's a small workforce kept to maintain them. Duties include checking the mantles and giving the lamps a weekly wind-up (the timer is controlled by a clockwork mechanism). 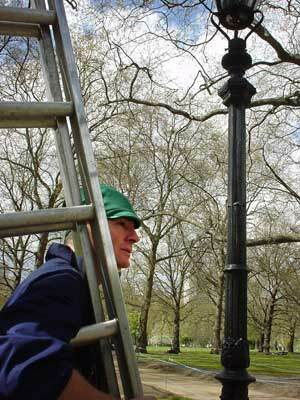 I got chatting to this Gas lamp man in Green Park and he told me that it's such a popular job that workers rarely leave.